I've been on a serious Cajun kick lately. Anything and everything Cajun, yes please, give me more. I have a huge playlist of Cajun & Zydeco music (some of it is even sung in French), recipes in my recipe box, and a bunch of new food blogs, like Cajunlicious, Cajun Delights, Real Cajun Cooking, that I am subscribed to. I wanted to try out a few recipes that normally I'd never try. I'd had Shrimp and Crawdad Po'Boys before and an amazing bread pudding, but that was about it. Those were items that I'd ordered from a great little restaurant in Montana of all places (warning, music on site), so I hadn't even tried cooking anything I would consider Cajun. The first dish I made was a Smothered Cajun Cube Steak Dish, which is also known as Smothered Swiss Steak. I don't really care for that name, though, because if you aren't familiar with the dish it just makes you think it is covered in cheese, which it isn't. 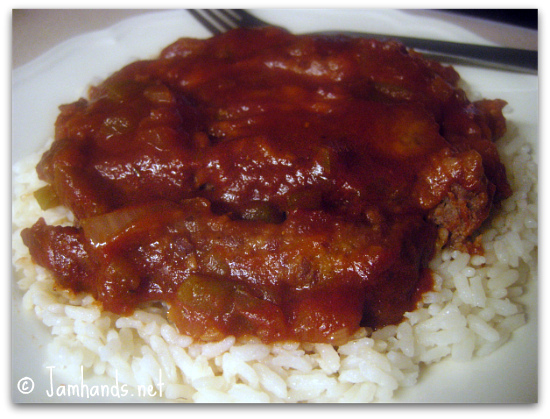 The Swiss in Swiss Steak is the term used to describe the way the meat is tenderized. One aspect of this dish that really piqued my interest was the use of a can of regular cola in the sauce. Keep in mind that in order to tenderize the cube steaks it has to simmer for a good hour, so plan ahead. The payoff is worth it though, no knife required, just use your fork to cut the super tender meat. It was delicious! I was so pleased that my first attempt at making something Cajun worked out so well. Enjoy! 1. Sprinkle salt evenly on both sides of the cube steaks. Combine flour and pepper in a shallow dish; dredge steaks in the flour mixture. 2. Brown 2 steaks in 1 1/2 tbsp hot oil in a large nonstick skillet over medium high heat 3 minutes each side; drain on paper towels. Repeat with remaining steaks and oil. Drain drippings from skillet, reserving 1 tbsp oil in skillet. 3. Saute onion and bell pepper in hot drippings 7 minutes or until tender. 4. Add diced tomatoes and remaining 5 ingredients to skillet. Bring to a boil, and cook, stirring often, 5 minutes or until slightly thickened. Return the steaks to the skillet; cover and cook over low heat 55 to 60 minutes or until tender. Serve over rice. Yummy! I like any recipe with "smothered" in the name. Yes there are a lot of great recipes at that website. I found this recipe off of Food.com which is close to her recipe for round steaks. I decided to go with an easier recipe that used cube steaks instead so it cooks faster. Looks great! Thanks for the shout out, cher! This looks yummy! I'm going to have to try it out!